I've received a number of reader requests asking if I could share more of Lynnderella's shades since announcing that she is now offering her polishes to the public. The most requested shade was Throwing Water Into The Ocean, and it's a beauty! This is an inky deep teal shade with a buildable base that reminds me of the old Maybelline Waters polishes. It's loaded with tiny purple and turquoise micro glitter that's secondary to the larger turquoise foil hex glitter. I used three coats, and the base seems to have some charcoal color mixed in with the deep teal. Macro shots are always nice to see, because they can give a more in-depth look at at the details. In many cases, those macro details aren't noticeable to the naked eye when wearing the polish, but that's not the case with this shade. Every detail in the macro shot is clearly evident on the nail. The formula on this shade is jelly textured, and the color and glitter detail begins to emerge nicely after the second coat. A third coat is optional if you prefer an opaque look, as I generally do. The drying time is a little quicker than most jellied glitters, and there's no staining (blues seems to stain on me more than other colors). 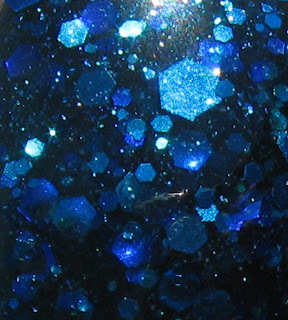 The finish dries to a high gloss shine, and because the glitter lays nice and flat, it's smooth as can be to the touch. Another upside to this shade is that when I remove it, there's no "dreaded foil removal" additional time required, because it comes off quite easily. More Lynnderella shade requests to come yet this week! 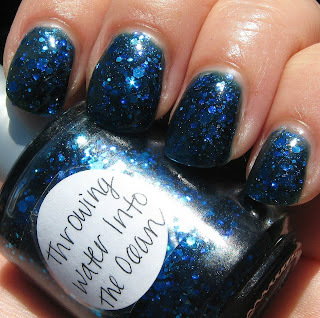 I'm also going to compare Throwing Water Into The Ocean with Deborah Lippmann's Across the Universe, because that was my first thought when I first saw this Lynnderella shade. Oooohh it looks so magical! I've never heard of this polish. It's stunning! This polish is magical. I love all the different glitter in this. Hope to see much more. Really amazingly beautiful! She really has a mastery of the mix! She needs to find a way to market as wide as her home brews will possibly let her! Agree with Wendy I forgot to add - it looks like she had inspiration from Deb Lippmann Across The Universe most certainly on this one. It definitely reminds me of DL's ATU or LSTB. It's still different though. so beautiful! It is amazing! Of course, if I could create something like Across the Universe myself, I'd be pretty happy too! I love this colour!! It's great!! Amazing!! I think that do not deliver here in Brazil is not it?